One a scale of 1 to romantic… where do you fall? I fall at the medium-low level… let’s call if a 4.6. Go easy on the candle light, long stem roses, and limo rides (unless there’s a hot tub in back). I don’t need jewelry, but diamonds are always nice (it’s a paradox, I dunno…). Carriage rides? Meh. Horse rides? Cooler. Horse ride followed by margaritas? Now you’re on to something. I’m not the heart locket and stuffed animal type. I’m more the Le Creuset and expensive chocolate type. I also think large pots of warm rice and chicken are an 8.7 on the romantic scale. 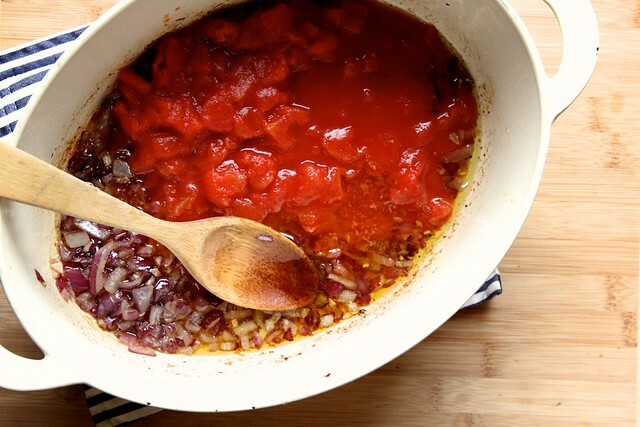 This is a really lovely, one-pot dish, that starts with wine and saffron. Many good things come from wine and saffron. Olives, rice, and chicken. That’s all we’re getting ourselves into. In a pot together, magic romantic things happen. Bubble and simmer. Bubble and simmer. Everything in the pot, and the rice soaks it all up. There’s no way to dry the chicken, or otherwise futz up this dish. If the rice gets burned and crunchy on the bottom… that’s totally the best part. There are a few tricks… if you’re using a large pot, make sure that you move it around on the burner so that the simmer hits every part of the pan. Fifteen minutes in the center of the pot. Ten minutes on one side of the pot. Ten minutes on the other side of the pot. Sometimes pockets of rice can remain uncooked if the pan is too large. Also.. don’t be afraid to add a touch more broth if your rice isn’t cooking up. No worries. Keep it easy. 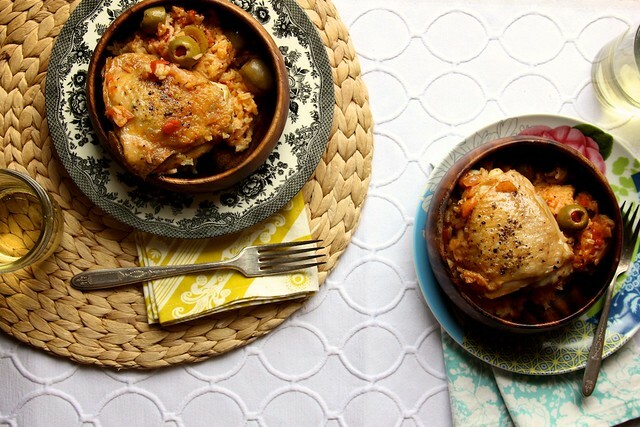 This Arroz con Pollo is a super classic, ultra-comforting dish. Listen… if you’d like to claim that your mother makes a better Arroz con Pollo that I do… guess what? You’re probably right. This dish is good… really really good. I just don’t want to do battle with your mother… that’s all I’m saying. 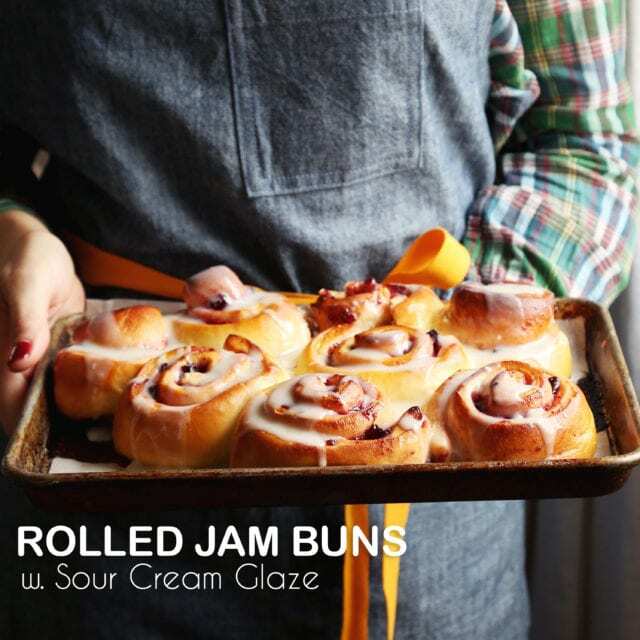 I’d love for you to make this dish for a special someone on, or near Valentine’s Day. It’s comfort food that should be shared with love. After dinner you can both stand around the pot with spoons and scrape the bottom of the pot for crunchy rice bits while you finish the bottle of wine. That’s romance. That’s friendship. That’s just love. 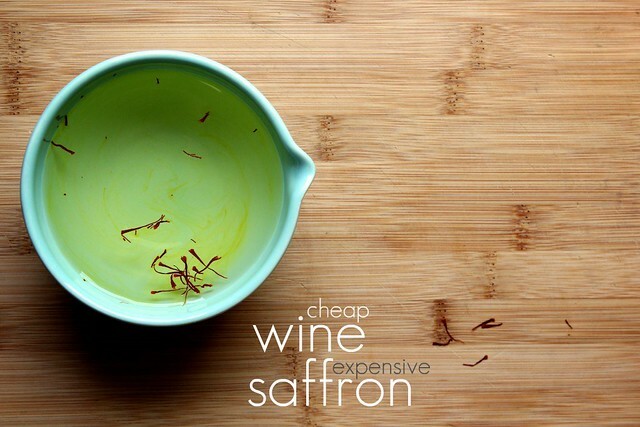 Combine wine and saffron in a small bowl. The saffron will begin to breed yellow. Great! Set aside. 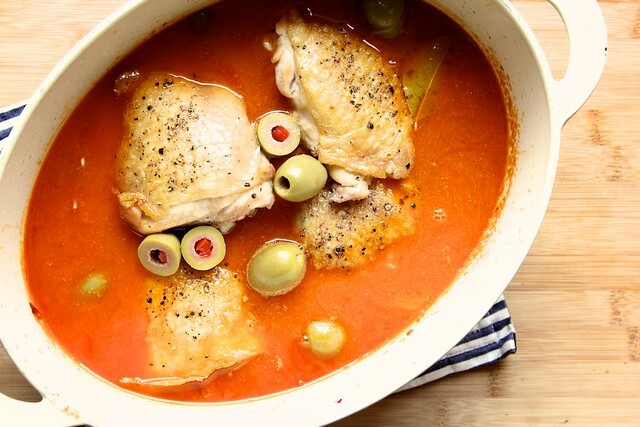 In a large, heavy-bottom saucepan or dutch oven, heat olive oil over medium heat. Season both sides of the chicken generously with salt and pepper. Place chicken pieces, skin side down, in the hot oil. Allow to crispy and fry for 4 to 5 minutes. Flip over and cook for another 2 minutes. Remove the chicken pieces from the hot pan and place on a clean plate. Add onions and garlic to the pan. Cook, stirring, until soft and tender, about 10 minutes. Add the partially drained can of tomatoes, bay leaf, salt and pepper, and saffron wine. Allow to simmer, uncovered, until the mixture has reduced by half, about 10-15 minutes. * There are a few tricks… if you’re using a large pot, make sure that you move it around on the burner so that the simmer hits every part of the pan. Fifteen minutes in the center of the pot. Ten minutes on one side of the pot. Ten minutes on the other side of the pot. Sometimes pockets of rice can remain uncooked if the pan is too large. Also.. don’t be afraid to add a touch more broth if your rice isn’t cooking up. No worries. Keep it easy. Check the rice after 30 minutes to make sure that it is cooking evenly. 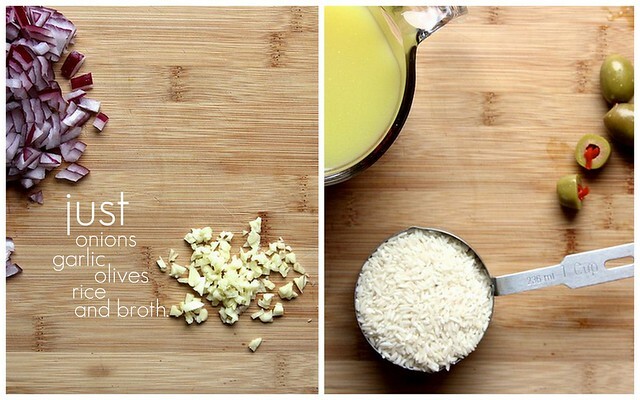 Add more broth, a cup at a time, if necessary. Once cooked, allow to rest for 10 minutes with the lid on. Dish will last, in a container in the fridge, for up to 3 or 4 days. Le Creuset is definitely romantic! As is KitchenAid. Any guy who shows up on my front porch with either one is a keeper, in my book. Holy yum! This recipe reminds me of a similar version to paella or briyani — bursting with flavors!!! 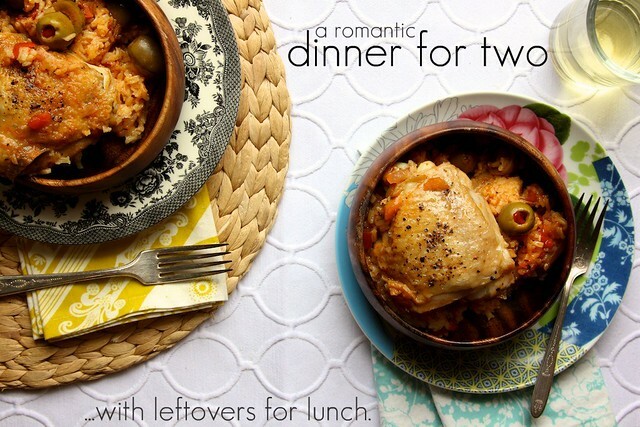 I totally agree that easy cleanup/anything cooked in one pot is romantic. This looks just lovely and a true winter warmer! Be still my Puerto Rican heart! I’m touched that you did a post for a classic! Arroz con pollo!! Woot! Woot! And, if you hadn’t noticed Puerto Rican food is slowly gaining foodie status (Saveur did a whole spread on PR food back in December). Anyway, growing up as a child in Puerto Rico, I still have deeply imprinted memories of my grandmother making arroz con pollo and then saving herself the crunchy rice at the bottom called “pegao” in Spanish. There are as many ways to cook arroz con pollo as there are mothers and grandmothers that cook it. Thanks for your rendition. I’ll definitely give it a try! Thank you. Thank you. I was racking my brain trying to remember the word “pegao”. The mother of one of my best friends in high school made this dish all the time and I’ve eaten it far too many times to count. Everyone in the family wanted the pegao, including me. 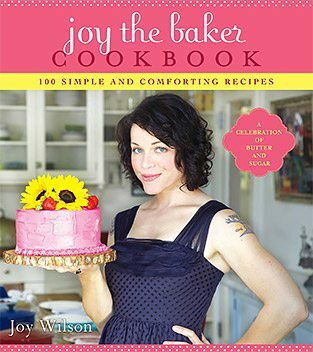 I can’t wait to make this dish. They did use achiote (annatto oil) in their rice too though, so I might add some. Thanks for the reminder. I too am a Le Creuset and expensive chocolate type. Those things and nice warm wool socks are the way to my heart. 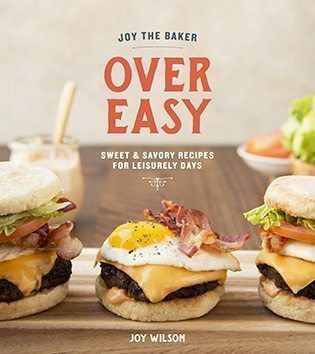 This is on my to do list of recipes for next week now. It’s supposed to be really cold in a week and I think will be just the thing to warm us all up! I’ve never had this and it’s been on my to try list for ages. Now, it seems, I must make it. 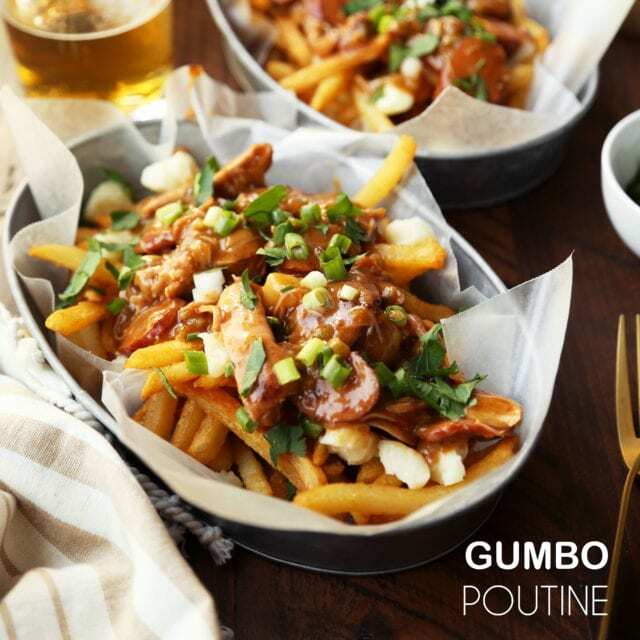 I love comforting dishes such as this and these types of dishes make amazing leftovers. We love leftovers in this house. It kind of reminds me of the chicken and rice served at Soul Food in San Rafael. I totally love crunchy rice. And wine, lots of wine. This dish and me… we’re going to be real good friends. I also love the bottom-of-the-pan crunchy rice :) Ah, looking at these pictures, I can almost smell this stuff. 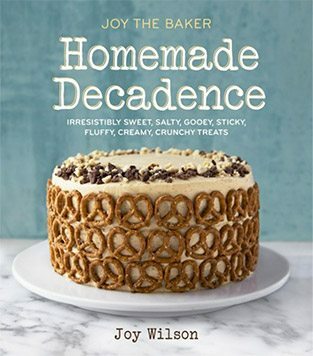 Joy, thanks for the recipe and happy almost Valentine’s Day!